Could Celtic and Rangers meet again in the English Premier League, thus creating a British super league? There was a report in the British press earlier this week in which the UK prime minister David Cameron is said to have expressed his desire for the Glasgow “Old Firm” of Celtic Football Club and Rangers Football Club to join the English Premier League (EPL). One may question Cameron’s political motives behind the proposal as he seeks to influence the vote north of the border in the oncoming referendum on Scottish independence to be held in September 2014 but the idea is far from new. In the Former Soviet Union (FSU), momentum has also gathered pace as a number of owners from top clubs in Russia and Ukraine seek to form a breakaway championship run along the same lines as the Kontinental Hockey League (KHL) which has been a major success since its inception in 2008. In the United States three Canadian clubs feature alongside their American counterparts showing that cross-border championships do happen in soccer as well as in other sports such as ice hockey, basketball and baseball. If the ideas proposed in the UK and the Former Soviet Union are eventually given the green light in the future will the leagues be as super as they look on paper or will it destroy the essence of the game? As the Scottish Premier League has diminished in strength over the last 25 years it was always going to result in calls for the big two of the Scottish game to apply to join the English league system. Since Aberdeen FC, under the management of Alex Ferguson, became the last team from outside the Old Firm to win the Scottish championship in the 1984-85 season, Rangers and Celtic have completely dominated the league to the point where any potential third force capable of breaking the duopoly seems almost impossible. But where would the Old Firm begin any potential English journey? Some have suggested that they should begin the Conference league (fifth tier), some say in the Championship (second tier) whilst some call for the Old Firm to join the Premier League at the first opportunity in order to increase what is already a substantial TV contract. Were the two Glasgow giants to join the EPL any time soon they see themselves playing against the likes of traditional major English clubs such as Liverpool, Manchester United, Arsenal and Chelsea, to name but four, as well as the possibility of facing the two biggest Welsh clubs of Swansea City, who are already in the EPL, and Cardiff City, who look very likely to join them next season, in order to create a truly British super league. This proposal, although attractive to many, would also see any number of clubs voting themselves out of a certain league in order to accommodate the Old Firm. Therefore the situation would be unlikely as it would be like turkeys voting for Christmas but it seems unlikely that the issue will go away. The alternative for the Old Firm would be to create what has been termed the “Atlantic League” along with the biggest clubs from the likes of Portugal, Netherlands, Belgium and Scandinavia in order to create more meaningful and lucrative opposition. The biggest clubs from those countries, for example FC Porto, Ajax Amsterdam and RSC Anderlecht, continue to dominate leagues in which competition over the years has weakened due to the increasing financial and sporting might of the big leagues. An Atlantic League would, therefore, allow stronger competition outside of officially sanctioned UEFA tournaments such as the Champions League and Europa League. Could the likes of Shakhtar Donetsk (orange) and Zenit St Petersburg meet in a new super league? In the case of the Former Soviet Union there will be many who miss football matches of the calibre of Spartak Moscow v Dynamo Kyiv, Zenit Saint Petersburg v Dnipro Dnipropetrovsk and Shakhtar Donetsk v CSKA Moscow. Owners and sponsors of the some of the biggest football clubs in the region are behind the idea to merge the top leagues of Russia and Ukraine together. Just like with the situation in the UK, there are perhaps political machinations at work in relation to the proposed new set-up here too. Ukraine is a country which is stuck between a rock and a hard place and seems to face a choice as to whether it wishes to become a member state of the European Union or to align itself with its former master of Russia. Whatever the political issues the new money which is prevalent amongst the biggest clubs in both Russia and Ukraine could force the hand of European football’s governing body UEFA who are naturally against such mergers. Increasingly, in the modern game, money talks and one wonders if the status quo will remain in place for much longer especially as the sport of ice hockey in the FSU region provides the footballing hierarchy with a prime example of a trans-national sporting competition which provides ice hockey clubs from Russia the chance to compete in arguably the second best competition in the world (after the National Hockey League in the US and Canada) alongside clubs from Ukraine, Latvia, Kazakhstan, Belraus, Czech Republic and Slovakia. It is not just in ice hockey where the trans-national approach has been broadly welcomed. Rugby union has embraced such competition in both the northern and southern hemispheres with the Anglo-Welsh Cup, Celtic League (top 14 clubs from Ireland, Scotland, Wales and Italy), Heineken Cup (equivalent to the UEFA Champions League) and the Super 15 (featuring the top 15 provincial teams from Australia, South Africa and New Zealand). The other oval ball code of rugby league also embraces such competition but on a much limited scale with one French club, the Catalan Dragons, playing in the northern hemisphere UK-based “Super League” whilst the New Zealand Warriors feature in Australia’s National Rugby League (NRL). As mentioned at the top of the piece there is currently one example of a football championship which currently uses such a system, namely Major League Soccer. Three of Canada’s top clubs – Toronto FC, Montreal Impact and Vancouver Whitecaps – play alongside the best 16 American clubs in a league which is run alongside similar lines to the other major leagues of ice hockey (NHL), baseball (MLB) and basketball (NBA). Could the KHL be an inspiration to trans-national sports competition? These events have largely come about for two reasons. With travel getting easier and the world becoming smaller thanks to modern technology it is natural that teams and individuals want to constantly challenge themselves against the very best on a regular basis. With the financial rewards that this brings then it is, for better or worse, another natural consequence that such teams and individuals will try to gain those rewards and, if necessary, upset the status quo in order to do so. If UEFA was to allow such cross-border league mergers along the Russia/Ukraine route or allow more of the MLS style leagues to become a reality (for example, a British League as discussed) then this could, and probably would, open up a can of worms for the game’s administrators at both UEFA and at FIFA, world football’s governing body. If such eventualities occur in Europe then how long before mergers become commonplace in South America, Africa, Asia and Oceania? 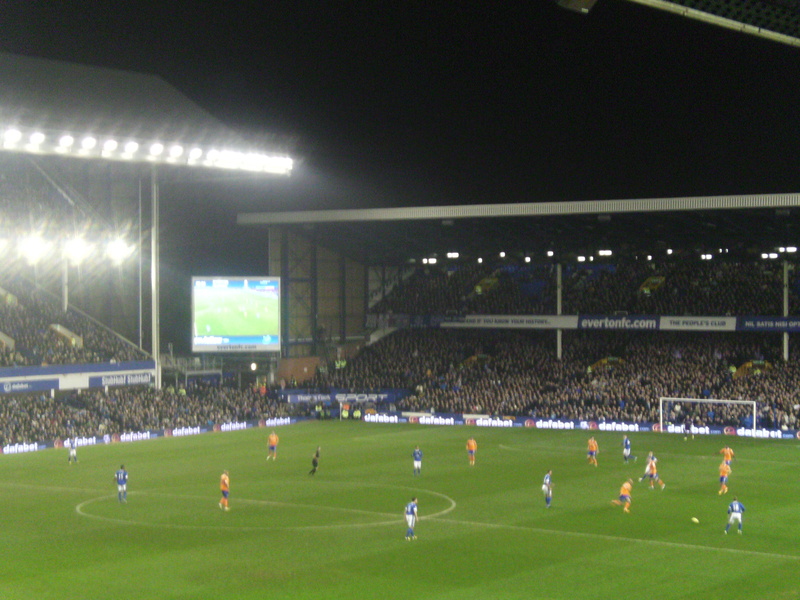 Whereas administrators from other sports have had to think outside the box and have undertaken such measures in order to broaden their appeal, football is the one truly global sport and it seems that whatever the traditions and customs which have made the game great in the past, its future could and probably will take a financially driven path down a whole new route. Three days after Oldham’s League One success against Portsmouth saw the continuation of the Latics’ FA Cup adventure. Having knocked out Liverpool FC in the fourth round, Athletic had salvaged a replay out of their fifth round clash against the blue half of Merseyside, Everton FC, when Matt Smith headed home a 95th minute equalizer in an exciting 2-2 draw at Boundary Park. 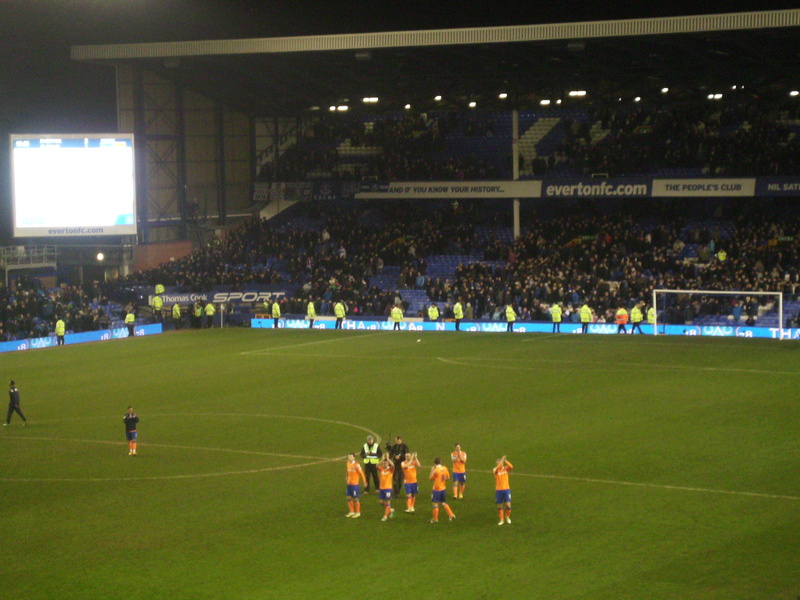 For Oldham it was a return to Goodison Park where they had achieved a famous 1-0 win over their hosts in the 2007-08 season and hopes were high amongst the Latics faithful that a repeat was on the cards. I met up with the guys from the “Two Teams One Spirit” group once again as it was thanks to them that I had the opportunity to go to the game in the first place. We met in the Taxi Drivers’ Club on Walton Hall Avenue, just a brisk 5-10 minute walk from the stadium, and a decent proportion of the 4,000 travelling support had already congregated there for a pre-match pint or two. At 7:45 we took our seats in the Bullens Road End and the travelling support were in good voice right from the off but it wouldn’t be long before all of the pre-match optimism would suddenly disappear. Fifteen minutes was all it took for Everton to take the lead, a Darron Gibson cross from midfield was taken from close range by an unmarked Kevin Mirallas on the half volley. The closest Oldham would come to scoring in the first half was when Jose Baxter, a former Everton player, was unfortunate to hit the post, a miss which would be punished on the 34th minute mark. A handball from Connor Brown saw a penalty given to the hosts for whom Leighton Baines made it 2-0 and already there was a big mountain to climb for the visitors. It was hard to take for Oldham to concede a goal from the penalty spot, especially as they had a strong case for a penalty of their own turned down following a handball by Gibson following the aforementioned Baxter opportunity. At half-time most of us talking over a quick beer in the stand agreed that the next goal would be crucial; if Everton scored it would be game over but an Oldham goal would bring back some hope. Unfortunately for Oldham it would be the former that would ring true as Leon Osman got a crucial touch onto a Steven Pienaar cross to make it 3-0 and put the game to bed. There was at least a consolation goal for Oldham fans to cheer as Matt Smith, who had scored some crucial goals in the cup run, rose highest to meet Jonathan Grounds’ corner kick to reduce the arrears just after the hour mark. However, that would be as good as it got for Oldham with the game finishing 3-1. After the game there was only enough time for me to wish the Oldham boys, whether they be English or German, a good trip back as they boarded the coaches lined up outside the stadium whilst yours truly took a short cab ride home with some very good memories from the last few days. On the pitch Everton are looking to qualify for Europe, either through a sufficiently high Premier League placing (currently lying in 6th place) or by winning the FA Cup for the first time since 1995. Oldham, on the other hand, will now hope to maintain their place in English football’s third tier as they currently lie 20th in the 24 team league. Saturday, 23rd February: a trip to the northern English town of Oldham had been on the cards for a while. 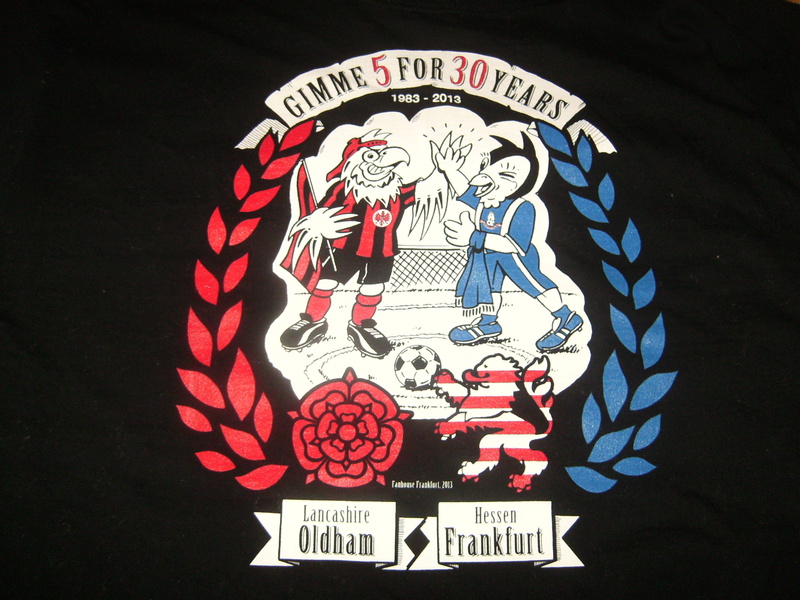 The trip not only coincided with a fine run in the FA Cup for the local team of Oldham Athletic but also with the 30th anniversary of a friendship between fans of the Latics and of German Bundesliga side Eintracht Frankfurt. Although hailing from Liverpool, yours truly is also a fan of Eintracht and have met up on a few occasions with the Eintracht fan group “EFC 11-er Freunde”, about whom I have previously written about regarding trips to Frankfurt, Nuremberg and Dortmund. In Oldham I was helping to commemorate another friendship called “Two Teams One Spirit”, a collection of Oldham fanatics and the Eintracht fan clubs of “Rhönadler” and “Bockenheim”, all of whom I originally met on my away day to Dortmund at the end of the 2010-11 season. Following an early morning train ride from Liverpool Lime Street to Manchester Victoria followed by a tram ride to Oldham Mumps, the day was still only twelve hours old and with plenty of time left for beer and football events started early in a pub called the Rifle Range. In there the German guys were selling T-shirts commemorating the 30 year friendship between the two sets of fans for £17.50 (20 Euro) so naturally I parted with the necessary money to own one. 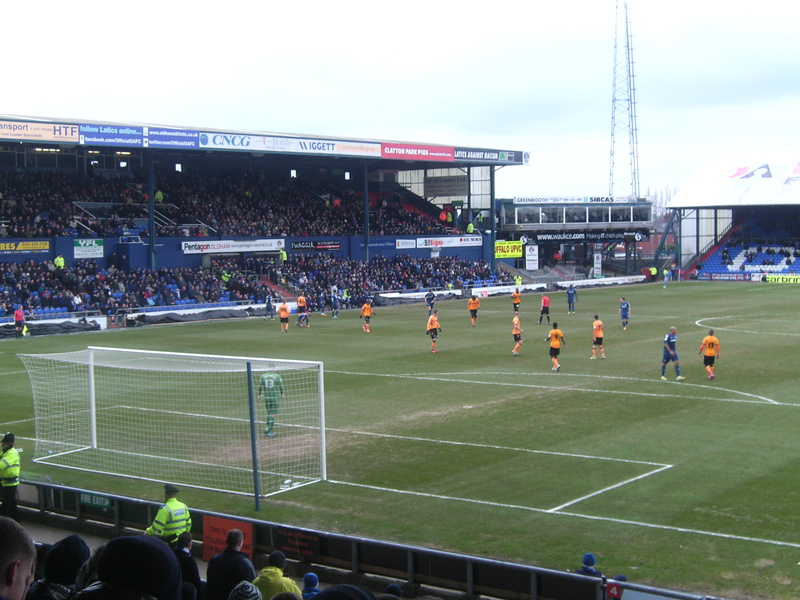 Oldham’s opponents on the day were Portsmouth FC, a club who had only been in the Premier League as recently as the 2009-10 season but were now rock bottom of the third-tier “League One”. Their most famous supporter, a man called John Westwood, stood out like a sore thumb in his usual matchday regalia of big hat, chequered blue and white clothes and all over body tattoos. One of the locals, Pete, had written to him personally and invited him to the pub before the game and whilst there a German called Bernhard had brought over a copy of the football magazine “11 Freunde” (no relation to the Eintracht fan club mentioned earlier) in which “Mr Portsmouth” himself featured in an article and was only too happy to sign the magazine. Before long it was time to go to Boundary Park, the home of the Latics, where we arrived with just minutes to spare before kick-off. After downing a pre-match beer we took our seats in the Rochdale Road End and saw a great strike from 25 yards out by Jose Baxter give Oldham the lead after just ten minutes. Sadly, though, the rest of the game was far from a classic with very few clear cut chances for either side. Oldham carved out a couple of decent efforts and the three points gained from the 1-0 win meant that they had won the last three league games in a row, a run which would help them in their fight against relegation. Portsmouth, on the other hand, were dreadful and I personally feel sorry to see the club suffering its current plight. With ownership issues, administration and issues of massive debt the last few years have really taken its toll on Portsmouth Football Club. To make matters worse on the pitch Sam Sodje was sent off after 50 minutes for violent conduct, his reaction to the red card as disagreeable as eating red cabbage after a skinful of beer on a Saturday night. The group stages of the African Cup of Nations concluded today with a couple of surprise inclusions making up the quarter-finals of the competition which begin on Friday. 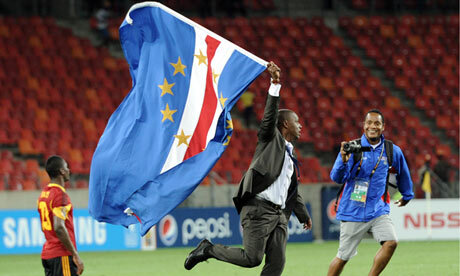 The biggest surprise came about in Group A where Cape Verde, making their first appearance in the tournament finals, managed to get through a tough group unbeaten. Having drawn their first two games against hosts South Africa and Morocco, Cape Verde were losing their final group game against Angola with ten minutes to play before they turned it around to win 2-1. The hero for the Blue Sharks was Heldon Ramos whose stoppage time winner allowed Cape Verde to finish second in the group behind South Africa on goal difference and progress ahead of the much fancied Morocco. The other surprise is Burkina Faso who progressed in first place from Group C and helped play their part in eliminating defending champions Zambia from the competition. Burkina Faso, who have previously only graced the knockout rounds of this tournament once in seven attempts, easily defeated Ethiopia and drew with fellow group qualifiers Nigeria as well as Zambia who needed to win the last group match in order to qualify for the last eight. Côte d’Ivoire are still most people’s favourites to win the competition having finished top of Group D ahead of Togo, Tunisia and Algeria. The likes of Yaya Touré, Gervinho and Didier Ya Konan have helped the Elephants to two wins and a draw, the same record which graced Group B winners Ghana. The Black Stars began their campaign with a 2-2 draw against Congo DR but finished it perfectly by defeating Mali, who also qualified from the group, and Niger who were the only team not to score in any of the group games. A wonder goal scored by league leaders Al Ain in the United Arab Emirates has gone viral and it is easy to see why. Currently top of the UAE Pro-League by a huge nine point margin, Al Ain are the record champions in the oil rich nation with ten league championships to their name. Al Ain, based in the Emirate of Abu Dhabi, have only lost one game so far this season and that defeat came on the opening day of the season against Al Ahli. Since then Al Ain have won twelve out of their next thirteen games in the league and are still competing in both domestic cup competitions, namely the Emirates Cup (group stages) and the President’s Cup (their quarter-final tie against Bani Yas is on February 10th). The most recent league match saw the runaway league leaders stroll to a 4-0 win over 10th place Ajman FC. Just the one goal separated the two teams at the half-time break, Jires Kembo-Ekoko breaking the deadlock in the 10th minute, but the second half saw Al Ain break clear with further strikes from Alex Brosque and Omar Abdulrahman before substitute Yousef Ahmad completed the rout in fine style. He got on the end of a flowing move which involved the whole team and contained no fewer than 19 passes and helped widen the gap at the top of the table between Al Ain (37 points) and nearest challengers Al Jazira and Bani Yas, both of whom have 28 points. Hosts Costa Rica won a record extending seventh Copa Centroamericana title in the nation’s capital of San José on Sunday when defeating defending champions Honduras. Costa Rica reached the final in fine style, winning two and drawing one of their three matches in the group stages, going on to defeat El Salvador 1-0 in the semi-final. Honduras’ route to the final was more laboured in comparison. Although they topped their group it was due to goals scored as all three teams in their group had the same number of points due to each game ending as a draw. In the semi-finals Honduras also needed just a solitary goal to progress thanks to Brayan Beckeles’ goal in the 67th minute of the game against Belize. The final would also prove just as tight with just a solitary strike from Giancarlo González in the 37th minute deciding the game in Costa Rica’s favour, giving los Ticos their first tournament win since 2007. The Copa Centroamericana also doubled out as a qualifying tournament for the CONCACAF Gold Cup, which takes place in July this year in the United States, with the best performing five teams progressing through. As well as the two finalists, losing semi-finalists Belize and El Salvador qualified along with Panama who defeated Guatemala 3-1 in the 5th/6th place play-off match last Friday. It had already been a fantastic week for cup shocks in England, with Bradford City and Swansea City both reaching the League Cup final, but this weekend saw the FA Cup provide further upsets for some of football’s big names. The same can also be said of the Scottish League Cup where favourites Celtic FC were knocked out at the semi-final stage by St Mirren. In Northern Ireland there would be cup celebrations for Cliftonville FC who convincingly defeated defending title holders Crusaders FC 4-0 in the League Cup final on Saturday. The FA Cup could be accused of having surpassed itself in terms of shocks this weekend with the likes of Liverpool, Tottenham Hotspur, Aston Villa and Norwich City going out to lower league opposition. Seven times winners Liverpool were the biggest casualties of the round losing 3-2 to League One (third tier) side Oldham Athletic whose progression to the next round has guaranteed them a home draw with Liverpool’s local rivals Everton. Matt Smith (2) and Reece Wabara scored the goals for Oldham whilst Luis Suarez and Joe Allen replied for the visitors in a match which effectively ruined Liverpool’s season. Out of both cups and lying in seventh place in the Premier League, Brendan Rodgers’ men can at least now concentrate on trying to climb the league table. Tottenham Hotspur also lost on Sunday away at Championship (second tier) side Leeds United at Elland Road. Luke Varney and Ross McCormack scored the goals which gave Leeds a 2-0 lead which was later halved by Clint Dempsey. Tottenham, however, were unable to equalize and Leeds held on to seal a fantastic win and will be rewarded with an away trip to Premier League champions Manchester City in the fifth round. Chelsea almost made it a hat-trick of cup shocks on Sunday but were able to secure a late draw against Brentford FC. Fernando Torres’ 83rd minute equalizer was enough to give the Blues a second chance and, should Rafael Benitez’s side prove successful in the replay, will see them travel to Middlesbrough in the next round. Amongst the other FA Cup games over the weekend struggling Aston Villa went out of the competition. Just three days after their elimination from the League Cup at the hands of Swansea, Villa were forced out of the FA Cup at the hands of League One side Millwall FC who defeated the Premier League side 2-1 on Friday night. Millwall’s reward for progressing is a trip to the only non-league side left in the competition, namely Luton Town. Luton narrowly defeated top flight club Norwich City 1-0 away at Carrow Road with Scott Rendell’s goal proving the difference. Elsewhere in the competition some of the big boys managed to get through to the next round unscathed. Record winners Manchester United easily saw off Fulham FC 4-1 at Old Trafford whilst Manchester City edged past Stoke City 1-0 at the latter’s Britannia Stadium. Arsenal did suffer a couple of scares, going behind twice, before persevering 3-2 away at Championship club Brighton and Hove Albion. The 2012-13 Scottish League Cup final will see Heart of Midlothian play against St Mirren following another exciting round of knockout action north of the border. Saturday saw Heart of Midlothian, currently holders of the Scottish FA Cup, play against Inverness Caledonian Thistle at Easter Road, the Edinburgh home of Hearts’ big rivals Hibernian FC. Andrew Shinnie (Inverness) and Michael Ngoo (Hearts) traded strikes as the game finished 1-1 with thirty added minutes of extra-time unable to separate the two sides. A penalty shoot-out then saw Inverness’ Phillip Roberts miss the crucial spot kick as Hearts went through 5-4 on penalties to leave the Jambos hoping of lifting their first League Cup title since 1963. Sunday saw another exciting semi-final at Hampden Park where Celtic FC have made a bad habit of losing crucial cup matches in the last couple of years. Following defeat to Kilmarnock in the final of last season’s tournament, Celtic went out at the hands of St Mirren today to leave coach Neil Lennon wondering just when he’ll enjoy some more luck in Scottish domestic knockout competition. Esmael Goncalves gave St Mirren the lead after 8 minutes but Gary Hooper equalized for the Hoops on the stroke of half-time. In the space of five second half minutes, however, St Mirren would set themselves up for a famous win thanks to a Paul McGowan penalty (64 mins) and a wonder strike from Steven Thompson (69 mins). Celtic did pull one back through Charlie Mulgrew’s stoppage time effort but the damage had already been done for Lennon’s men. St Mirren will hope it will be third time lucky for them in the League Cup final having lost in their two previous final encounters in 1956 (v Aberdeen) and 2010 (v Rangers). In Northern Ireland’s League Cup tournament Cliftonville FC won the trophy for the second time in their history on Saturday following a convincing 4-0 win over 2011-12 winners Crusaders FC. Goals from Diarmuid O’Carroll, Joe Gormley (2) and Ryan Catney saw off the defending title holders and gave Cliftonville their first success in this competition in eight years. Tournament hosts Russia emerged victorious for the second year in a row in the Commonwealth of Independent States (CIS) Cup today following a 4-2 win over arch-rivals Ukraine in St Petersburg. The form guide going into the final suggested that Ukraine were the favourites over Russia. The Ukrainians finished top of Group C ahead of Lithuania, Moldova and Turkmenistan with a 100% record before fate decided that they would meet two of their group opponents in the knockout rounds; Moldova were thrashed 5-0 in the quarter-finals before Ukraine won by the odd goal in three in their semi-final against Lithuania. Russia, on the other hand, won one and drew the other two games in Group B but still managed to top the group ahead of Kyrgyzstan, Kazakhstan and Uzbekistan who they also beat in the quarter-finals before they won their semi-final match against Belarus by two goals to one. The final, played before a 10,000 crowd at St Petersburg’s Sports and Concert Complex, turned out to be a goal fest. Russia took the lead after just five minutes through Nikita Bocharov only for Vladyslav Kalitvintsev to equalize just ten minutes later. The Russians would end the first half holding a 2-1 advantage following Andrei Panyukov’s 38th minute strike but Ukraine levelled matters for a second time after the break when Vitali Ivanko made it 2-2 just after the hour mark. Panyukov bagged his second goal of the game in the 75th minute to re-establish Russia’s lead for a third time, one which they would fail to relinquish. The deal was sealed in stoppage time when Emin Makhmudov scored from the penalty spot and gave the host nation title glory for the second year in a row. Having begun as a pre-season tournament for champion club sides from the former Soviet republics, the CIS Cup decided to change in 2012 in order to incorporate national youth teams. This was as a result of the waning interest shown to the competition by various club sides that preferred either to spend pre-season training in warmer climes or to participate in much more financially lucrative pre-season competition elsewhere. Nevertheless the competition has gained a renewed sense of purpose under its current guise and today’s final between two talented teams of youngsters shows that this competition might just have a vibrant future yet. It’s been a pretty intense few days in the preliminary round of Oceania’s Under-17 Football Championship and there has been no shortage of goals in what’s been a very open tournament. Emerging victorious are the Cook Islands whose 2-1 win over host nation Samoa in the last round of matches played today in the Samoan capital city of Apia has won them through to the next stage. Twenty eight goals were scored in the six games to have been played since Tuesday, an average of just over four and a half a game, and all of them have added to a fascinating competition in which drama was in no short supply. Cook Islands got their tournament off to the best possible start on Tuesday when defeating Tonga 7-1 with six different players getting on the score sheet, Maro Bonsu-Maro being the only player to score two goals. In the derby match, Samoa and American Samoa shared the spoils with a 2-2 draw to leave the Cook Islanders topping the table after matchday one. Things suddenly changed on matchday two when the Cook Islands were overtaken at the top by American Samoa. The latter defeated the former 3-0 with Sinisi Tua bagging a brace. Samoa got the better of Tonga, winning by the odd goal in five with Paulo Scanlan’s hat-trick proving crucial in Samoa’s 3-2 win. Going into today’s final round of matches three teams – Samoa, American Samoa and Cook Islands – all had the chance to claim the trophy. Tonga, up until now the whipping boys of the group, were in no position to gift their opponents American Samoa the title. American Samoa seemed to be coasting their way to victory when going 2-0 ahead after 48 minutes thanks to goals from Paia Ipiniu and Sinisa Tua but the Tongans were to end up shocking their opponents by turning the match around with three goals in the last nineteen minutes. Uasi Talanoa, Hemaloto Polovili and Taniela Vaka’uta, whose goal came deep into stoppage time, claimed Tonga’s first win of the tournament and opened the door for Samoa and Cook Islands to claim the title in the other match. In another topsy-turvy encounter it was Samoa who took the lead after 23 minutes thanks to Sue Pelesa, an advantage they would see through to half-time. Fifteen minutes into the second half saw the Cook Islands restore parity, Takuina Tararo heading home the equalizer, but they had to wait until four minutes from full-time before they were to score the crucial goal which would eventually clinch the championship. Step forward Dwayne Tiputoa whose late charge saw him slot the ball home and break the hearts of Samoa, for whom a draw would’ve been enough to give them the title following American Samoa’s surprise defeat. Cook Islands topped the table with six points from three games, both American Samoa and Samoa have four points with the former holding on to second place on goal difference whilst Tonga prop up the rest with three points. The Cook Islands can now prepare for the tournament proper of the OFC under-17 Championship where they face off against seven other nations including the likes of New Zealand, Solomon Islands and hosts Vanuatu from April 17th-27th. The winner of that can then look forward to representing Oceania on the world stage when the FIFA Under-17 World Cup takes place in the United Arab Emirates between October 17th-November 8th. Twenty one people have been sentenced to death in Egypt as punishment for their involvement in the football riots of Port Said last year in which 74 people were killed. Riots occurred on February 1st 2012 following an Egyptian League match between Al Masry of Port Said and Al Ahly of Cairo in which fans of the home team, following their 3-1 win over the record champions, charged at Al Ahly supporters and accusations have also been made against the police who have been accused of not doing enough to prevent the trouble on the day. In a situation where political tensions are already potentially at breaking point at any time, the ruling of this case inevitably brought about rioting in Port Said whereas in Cairo the verdict was greeted with celebration. 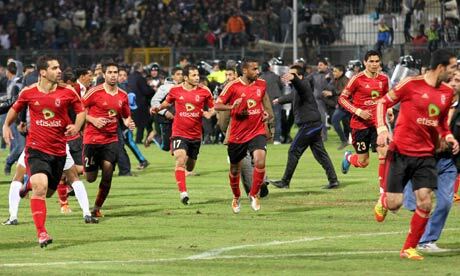 Egypt’s football league has been suspended since the Port Said disaster and is due to be resumed in February this year. However, two years after the revolution which helped to topple former president Hosni Mubarak, events in relation to this case will inevitably provide doubts as to whether the country is ready to resume hosting top flight football matches at a time when the country is still politically sensitive.